I have this prejudice against “dying child” books. Basically, I feel like it’s cheating. Dying children is a sad topic; and as an author, you don’t have to work very hard to make me cry. If I’m going to cry, I want to be moved by a depth of character or deeply complicated plot that leaves me wishing I’d written the thing. I’ll still read a “dying child” book, but it’s going to have to work extra hard to make me love it. 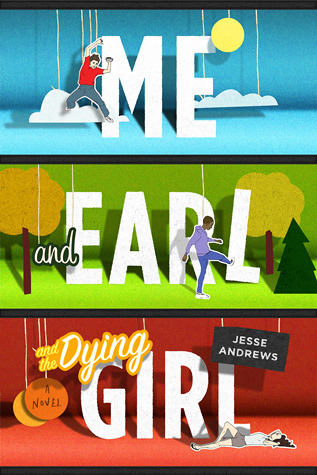 That being said, Jesse Andrews didn’t try through typical means to give his main character, Greg, a meaningful connection to the dying girl. The connection between them wasn’t the point. The way he went about trying to be friends with her (his mom forces him to) put Greg in an increasingly brighter spotlight at school. This is Greg’s greatest fear. This unique way of pushing Greg to be something different and better by book’s end kept me engaged. And I left behind my prejudice for the “dying child” plot device. The plot was piled over by a long and windy trail of descriptions of people, back-story, and self-deprecation by Greg as he tells his tale. And while the voice was admirable and probably very true to teenage boy, I found it at times distracting. He often referenced how bad a writer he is. Occasionally, I grew antsy and impatient with Greg telling me I probably wanted to punch myself in the face. Overall, the voice was funny and the whole reason I read it was because my 15-year old cracked up the whole way through this book and begged me to read it next. I’m glad I did. I was a great book. One last thing: I especially like that the characters were carefully unique–misfits without knowing they were misfits, or at least no one was shouting or overtly angsty about not fitting in. Their qualities and traits felt real. Both my teenager and I love a book that makes an outsider so quietly accessible.